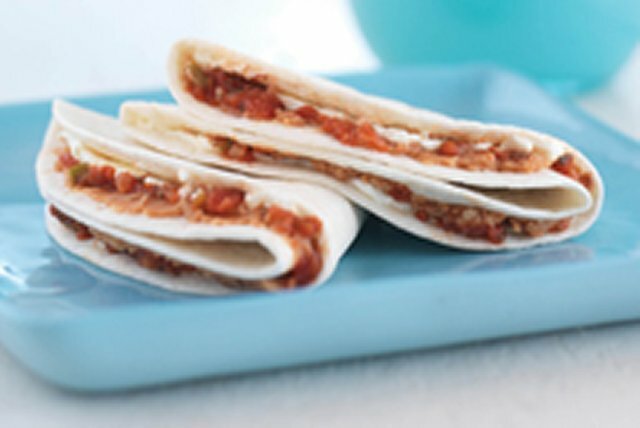 The kids will love these tasty mini-quesadillas. Spread half of each tortilla with 1 Tbsp. cream cheese product. Spread remaining half of each tortilla with 1 Tbsp. beans, then drizzle with salsa. Fold each tortilla into quarters to make triangle. To serve warm, wrap each tortilla triangle in paper towel. Microwave on HIGH 10 sec. Try using sliced black olives, sliced green onions or shredded lettuce instead of the salsa.